Early season monarch butterflies and you. Monarch's are now all over North America. Mexico has monarchs. America has monarchs. Canada has monarchs. Summertime is primetime for monarchs to migrate. Use the milkweed locater to see which type of milkweed is native to your state. Monarchs are not on My Milkweed, Why? The distribution of monarchs can appear to be uneven at times. I am happy to have seen a total of three monarchs in my yard this year. It is still early in the monarch's migration season. No eggs have been laid on my milkweed yet. The milkweed patch is a busy habitat for hundreds of animals that visit the plant throughout the summer. Bees are actively pollinating the blooms. Spiders are laying in wait for tiny bugs. Tiny bugs are striving to survive on the milkweed plants. One of the smallest animals on milkweed is the monarch caterpillar. Caterpillars can be very difficult to see when they are small. A newly hatched caterpillar is only 2-6mm in length (source: Monarch Watch) and nearly transparent. The day after my latest caterpillar hatched I didn't see it on the milkweed until two days later. They could be hiding out in the open. The monarch lifecycle is an amazing process. Metamorphosis is incredibly complex and requires that many steps in the process goes well for the monarch to take flight. An entire metamorphosis from egg to butterfly occurs in about 30 days. As monarchs enter your region of N. America they may be at the end of their short life. An egg laying female is likely to lay as many as 500 eggs on the milkweed plants in her lifetime. Those eggs take about a week to hatch the tiny caterpillar. It may be another week before you notice the leaves being chewed up by the hungry caterpillars. Once the caterpillars have grown thru five instars they may have crawled away from the milkweed to form the chrysalis. The chrysalis is the last step in metamorphosis before the butterfly takes flight. As fun as looking for monarchs in flight can be, we may be looking in the wrong place. Egg, caterpillar and chrysalis are also monarchs that haven't gotten ready to fly. Take some time to look at the milkweed throughly. Eggs are small, oblong and have a light gold color. You may find an egg before you see a monarch. While traveling to attend a wedding visited a park that I went to in 2014. There was milkweed in the park in 2014 so I was hopeful to find monarchs in 2015. While I did not see any monarchs, I did see a viceroy butterfly. The Viceroy butterfly (Limenitis archippus) has the orange and black color that resembles a monarch butterfly but has a distinct black line which does not appear on a monarch butterfly (Danaus plexippus). The adult Viceroy will nectar on milkweed and other pollinating flowers but their host plant is not milkweed. A Viceroy caterpillar will eat willow and cottonwood's rather than milkweed. Although I had not seen a monarch in flight I chose to search for signs that there were monarchs visiting the many milkweed plants in the park. By looking under the leaves of the showy milkweed plants I was able to observe eight monarch eggs. By finding eight eggs I was able to confirm, without a doubt, monarchs are flying around in Twin Falls Idaho. Roadside mowing is a real threat to milkweed. In this photo the milkweed was just out of reach of the mowers blades. If you look closely at the leaves you will see that some of the nearby plants are piercing these showy milkweed leaves. 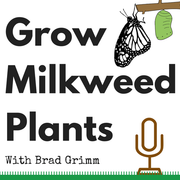 Pesticide and herbicide use is another threat to milkweed. Fortunately, the plants in this park don't appear to getting sprayed by pesticides or herbicides. Thistles did get hit by roundup or other similar product. Luckily for the milkweed community they were spared the spray this week. In one month a monarch can be raised in your home. With a little preparation and a lot of patience you can contribute to the monarch butterfly population explosion that is overdue. I have a goal to raise and release twenty-five healthy monarch butterflies in 2015. The most natural approach to supporting monarchs is to grow milkweed on your property. Monarch waystations and pollinator gardens are hugely successful and provide wonderful habitats for monarchs and other beneficial insects. Currently I am growing milkweed in a monarch waystation. The name of my way station is "The Biggest Little Butterfly Garden In The World" Monarch waystation #8269 as registered with the Monarch Watch Waystation Program. Registering your garden is not necessary. I chose to register and even ordered the cool sign. I consider it a donation to a good cause. The monarchs habitat is a cruel unforgiving place to grow up. Spending a month outside in the elements is dangerous, even in the summer, for a monarch larvae. Eggs get eaten, caterpillars become meals. Chrysalids can become damaged. Any one of these events will kill that monarch larvae. To control the process I am trying to raise this years 25 monarchs indoors. By preventing eggs from being eaten. Keeping caterpillars from becoming meals. And by hosting the chrysalids in a safe place I plan to increase the survival rate from a dismal 5% to above 75%. Some folks raising monarchs report successful rearing of above 95%. By removing a few variable from the environment the monarchs stand a better chance of completing their metamorphosis. As a monarch enthusiast I am seeking to spur a monarch butterfly population explosion. With the population at record lows we are faced with a tipping point. On one end is extinction and on the other end is survival of the species. I set a personal goal to raise 2,500% more monarchs in 2015 than I did in 2014. Time is the biggest factor that is working against me. September is when all monarchs depart Reno, NV. To my advantage, I have more milkweed now than I had last year. I am also getting an earlier start on the season by nearly two months. As I am writing this there is one caterpillar eating tropical milkweed in my new rearing cage. Make milkweed your friend. Your friends will love your milkweed. My name is Brad. Learn more about me now.